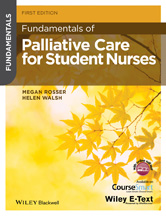 Fundamentals of Palliative Care for Student Nurses is a thorough yet accessible introduction and overview of a key area of the nursing programme. This resource clearly explains the palliation of symptoms and the social context of death and dying. Engaging with the latest guidelines and curriculum, it highlights the practical and communicative skills required for induction programmes and continuing professional development. Why is interprofessional team work important in palliative care? What stops a team from working well? What is stress and why do we need to know about it?